Have You Fallen Victim To These Social Media Scams? 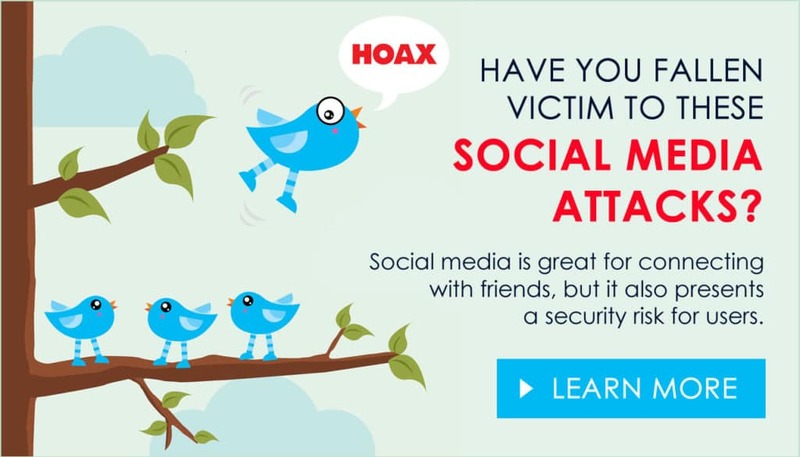 Facebook, Twitter, Instagram, and other social media sites are great for reconnecting with old friends and making new ones, but these networks also present a massive security risk for users. Over the past few years, social media sites have become a hot spot for nefarious criminals, bent on wreaking havoc and separating innocent victims from their hard-earned money. If you’re not careful, you could find yourself the next victim of these social media scam artists. In an effort to spread awareness about this reprehensible activity, we’re sharing some of the most common social media scams – and how to protect yourself against them. This scam notifies victims that their Facebook accounts have been hacked, but it is all a hoax. Responding to the warnings could put your real account at risk, and your personal information with it. The hoax hack appears as a warning from a Facebook friend. The message claims that their account has been hacked, and warns you not to accept any of their friend requests. In some cases, the message will come in the form of a private message notifying you that your account has been compromised. This particular hack report is a hoax, and it has a number of distinguishing characteristics. The biggest giveaway is a sudden message from a friend, warning that their own account has been hacked and cautioning against accepting new friend requests. If you are concerned about the legitimacy of the message, contact the friend in question – off the Facebook platform. Catfish may be a fun TV show, but it is much less entertaining in real life. The catfishing scheme was very popular on Facebook this year, and it’s rapidly spreading to other social media sites. Catfishing happens when someone creates a fake profile on social media or other online sites. The goal of the catfishing scheme is to prey on the good nature, naiveté or loneliness of the intended victim, and the results can be personally, emotionally and financially devastating. Catfishing scams are rampant on social media and dating sites, and they often follow a familiar pattern. The scam artist may reach out in search of a romantic relationship or pose as a long-lost friend. They may express feelings of love and affection after just a few days in an attempt to foster an emotional connection. As time goes by, the perpetrator of the catfish scam may ask for money or spin tales of sudden financial woes. Those who respond could lose thousands of dollars, or even their life savings. The hijacked profile scam also uses a fake profile, posting real photos and authentic details to pose as legitimate social media users. Once they have been accepted as legitimate users, the hijackers may try to extort money from their victims – or obtain sensitive personal information that could aid a future identity theft. In some cases, the profile hijacker will make up an account, swiping legitimate photographs and personal information gleaned from existing Facebook or other social media accounts. In other cases, the hijacker will take over an authentic account by guessing the password or scraping it using black-market software. A request for money or stories of financial distress are some of the warning signs of this scam. Even if your heartstrings have been tugged, take a step back and add a healthy dose of skepticism. Taking the time to make sure the request is legitimate could protect your pocketbook – and your privacy. Everyone would love to win the lottery, and the scammers know that. The fake lottery scam is always a popular one, and it has already ensnared lots of victims. In this common scam, Facebook users are notified that they have won the lottery, but there is a catch. In order to claim their winnings, the victim will have to pay a fee, purportedly for taxes. Once the money changes hands, the lottery official disappears, along with the victim’s funds. An unexpected lottery windfall may be enticing, but if it comes out of the blue, it is most likely a scam. If you bought a lottery ticket, you can check it yourself, without the social media outreach. A request for up-front payment of taxes or other fees is a dead giveaway; legitimate lotteries do not operate in this manner. If you receive such a message, just ignore it – your wallet will thank you. If you have ever clicked on an online quiz in your Facebook newsfeed, you may be a victim of this scam. The quizzes are real, with real results, but their purpose is to mine information, not reveal your personality or tell you which Star Wars character you are. Information is a valuable commodity, and scammers will go to great lengths to get it. The perpetrators of this common scam create quizzes designed to spark curiosity and a sense of fun, but those who click can have their personal information gathered, often for nefarious purposes. The presence of an innocent-sounding quiz in your newsfeed is the thing to look for, so watch your Facebook feed carefully and resist the urge to click. If you do decide to participate, know that the quiz could be fishing for your personal information, and the information of your Facebook friends. Facebook and other social media sites have become popular venues for sharing news and information, and the posters often include links to the original news sources. The shortened URL scam takes advantage of this trend, using the shortened version of the URL to mask a malicious website. In this scam, social media users see a shortened URL, a common sight on the internet. What makes this scam so dangerous is that the shortened URL actually points to a malicious website, one that could harbor malware or download and install a key logging program that captures user IDs and passwords. The sudden appearance of a shortened URL in your Facebook feed or private messaging system is the most obvious thing to look for. If you have any doubts about the legitimacy or usefulness of a linked site, just don’t click. Chain letters used to be a popular snail mail scam, and now they are migrating to social media. Facebook and Snapchat are the most common venues for this scam, but chain messages can show up anywhere. Chain messages can take many forms, from warnings that your memories and photos are about to be deleted to promises that a charitable donation will be made in your name if you pass the message along. The writers of these chain messages often use urgency to their advantage, encouraging victims to act now or forever lose their data. This urgency can be frightening, but it pays to wait a minute before acting. Research the chain message by Googling a block of text – you may encounter a warning that the social media chain letter is really a scam. Social media scams are not going away, so it is important for you to protect yourself. Even if you have not fallen victim to one of the scams listed above, it’s only a matter of time before the next attempt lands in your news feed. A little skepticism goes a long way online, so always think before you click. We hired OnTech a year ago, and are grateful we did! Prior to, we heard complaining from team members regarding various tech elements. No more! Our company invested in the equipment/programs they suggested for OUR company and OUR size of staff. They were spot on! No more complaints about slow computers, programs freezing up, or being tied to the phone. OnTech has given us freedom, flexibility and security in our day to day work life. In fact, I’m not sure how we functioned without them! Have a problem? Need something urgent fixed/looked into? ONTECH! Today is a GREAT example of their efforts. I called in with a problem that had a team member shut down. Shortly after, our IT Consultant, Dan Dineen, called to help me and SOLVED the issue. Dan is endlessly patient; his knowledge is amazing and he’s always going above and beyond. That’s OnTech as a whole! I’m impressed every time I need to call in for help. If you are looking for help with any of your IT needs, look no further! Call them TODAY! My full time employer came across OnTech from a cold call from Jackie. While talking to her, OnTech had better rates than the company we were currently using for outside tech support (I'm being nice and not naming the company). As it was, the outside tech support company we were using at the time we were becoming unimpressed with, so I talked with management into giving OnTech a chance. Once OnTech came in as our outside tech support, we've been nothing but impressed! Dealing with Keegan, John, and Dan (as well as a few others, but these 3 have been our main contacts) has always met or exceeded the expectations of ours. The team actually listens to what we have to say for what we are looking for and will come back with one or more solutions at all times. In the end, I highly recommend OnTech to anyone looking for a team to help give you resolutions with your technology needs as well as support!